Steinberg Law Firm is pleased to announce the addition of the firm’s newest associate in its Summerville office, Elliotte Quinn, and the expansion of the firm into the area of construction law. Quinn is an accomplished attorney who represents homeowners and property owners’ associations seeking compensation for defective construction. Construction defects cause property damage that lowers the value of a home or condo and, in some cases, are safety and health hazards to the people living in and around the building. A Charleston native, Quinn graduated with honors from the College of Charleston and received his law degree with high honors from Emory University School of Law in Atlanta, Georgia. While in law school, Quinn served as the Executive Articles Editor for the Emory Law Journal. He also received several honors and awards at Emory, including the Pro Bono Medal for providing legal services to those in need, the Order of the Coif, the Paul Bryan Prize and the International Association of Defense Counsel’s legal writing prize. After law school, Quinn clerked for a federal judge in the Northern District of Alabama and Justice Kaye Hearn of the South Carolina Supreme Court. 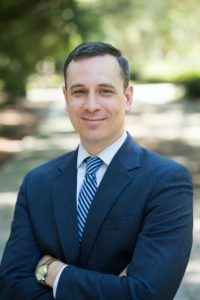 Before joining Steinberg Law Firm in 2018, Quinn worked as a litigator in the Charleston office of a highly respected regional firm where he concentrated on construction defect disputes, defending several of the most prominent national homebuilders in construction defect cases and amassing invaluable insight into how builders fight claims. Quinn is a member of the South Carolina Bar’s Construction Law Section and the American Bar Association’s Forum on Construction Law. Among the numerous publications he has authored in the construction law field, Quinn co-wrote a chapter in The 2017 A201 Deskbook containing revisions to the industry’s most common construction contracts. In addition to his extensive professional experience, Quinn is an active member of the community. He serves on the board of directors for the Palmetto Project, a nonprofit focused on developing innovative solutions to social and economic problems in South Carolina, and provides legal assistance to victims at a local domestic violence shelter. Quinn also recently joined the board of directors for Dorchester Paws, a nonprofit animal shelter in Summerville. Quinn, his wife Lyndsey and their two daughters live in West Ashley and are members of Circular Congregational Church. The legal team at Steinberg Law Firm is excited to welcome Quinn to the practice and look forward to working with him as he advocates for homeowners. He is passionate about defending the rights of homeowners, and knows what it takes to bring an effective case to recover damages for building defects. The initial consultation is completely confidential, no obligation, and at no cost to you. Our phones are answered day or night and our legal staff is always standing by to help you.